As part of the local community, we will share our journey and our dreams with soccer fans around the world. As a representative of our community, we will continue to inspire the world through the excitement of soccer. Jubilo means "joy" in Portugese and Spanish. The club was named after a wish to provide joy and inspiration to each of its many generous fans. The club color is saxe blue. 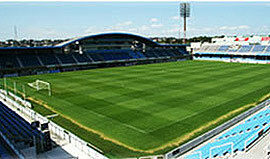 YAMAHA STADIUM, which is used for playing soccer and rugby, is a stadium designed especially for ball games. This stadium features a fully covered main seating area and a steeply inclined ( 35 degrees) huge back stand. Operated and managed by a football club, it is one of the few stadiums used only for football in Japan. It is said this is the most comfortable stadium in which to watch a game in Japan.